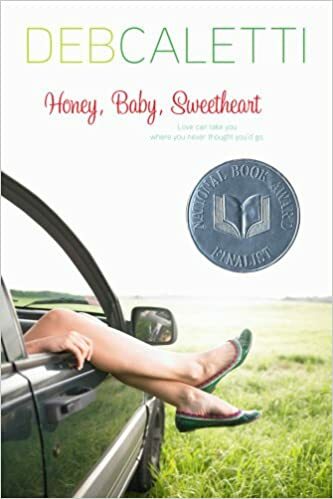 Deb Caletti’s 2004 novel, Honey, Baby, Sweetheart was selected as a National Book Award finalist, which was, I must admit, my primary motivation for reading it. I’m compelled to read any book that has a certain amount of gravitas or esteem surrounding it; I’m always fascinated by what others consider “good” or even “great” literature. And if I don’t see the good in it, does it mean I have better taste than most people, or does it mean I’m a bad reader. I was forced to ask myself that question in the middle of Caletti’s novel, which expected to finish in a day or two, but which took me nearly a week. It started of promising enough, but I found that the buildup to Ruby’s relationship with Travis Becker was so abrupt, it nearly gave me whiplash. That being said, Caletti does an admirable job at delving into the reasons why women remain committed to relationships that are bad for them. Because it can’t always be as simple as walking away. Personally, I had a difficult time with that concept, though I think Caletti’s exploration is what made the novel such a critical success. Growing up, I was always encouraged to rage fiercely against any type of entrapment or persuasion by a significant other. When I was old enough to date, I found myself in a situation where I felt like I was being pushed into situations and interactions that went against who I was as I person, and eventually I raged against that person. I’ve lost all the people I’ve dated to that particular rage, and I’m not the least bit sorry. And because of that, it was strange to see Ruby and her mother give themselves away to it when they knew, and felt, that it went against who they were. Caletti has moments of brilliant writing where the insights she showcases are genuinely intriguing, but for the most part, her writing was a little heavy-handed. I can imagine that many readers are attracted to that style of writing, but I’m drawn to sparse prose in which writers say a lot through a little. In fairness, I probably would have loved this book when I was a teenager, but my tastes have changed. I did appreciate the humor of the “Casserole Ladies” who let loose some seriously funny jokes and pranks, but their antics weren’t enough to raise the above the standing I gave it. For young people out there, or parents who are looking for a book for their child, Honey, Baby, Sweetheart is a worthy choice. It’s an important book for you women to read even though the execution might be a little off-kilter. It’s wholly enjoyable and full of well-developed characters. In terms of summer reading, it’s perfect.